Enjoy an epic day in the water with our Bodyboard Experience Day. You will begin with a two-hour bodyboarding lesson with our experienced instructor and then have free use of the equipment for the remainder of the day. Plenty of time to put into practice what you learned during the lesson. 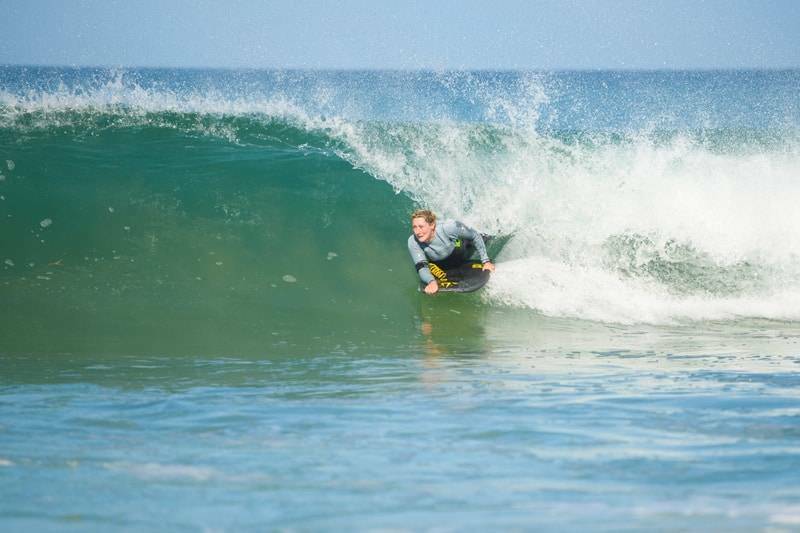 Our Bodyboard Experience Days offer a two-hour bodyboard lesson in the morning, designed to match your riding ability and build your bodyboarding confidence! Then, in the afternoon with the morning’s tuition in mind. Your expert instructors will identify the best beach for your abilities, share top tips and expect an update on your adventures at the end of the day! At our Newquay bodyboard school we’ve noticed that people often learn quicker when they get the opportunity to practice and experiment with what they’ve learnt, in a pressure free session – The Bodyboard Experience Day enables you to do just that. Can anyone join the Bodyboard Experience Day? Of course! Whether you’re a seasoned pro or absolute beginner, everyone is welcome. Our brand-new base down on Newquay’s Towan Beach is in the perfect location to learn the basics and improve your skills. Atlantic swell wraps around Towan headland to reach our sheltered bay, we have perfect waves breaking on golden sand. All equipment including wetsuits, bodyboards, ID vests, swim fins and fin socks are provided along with changing facilities and safe storage for your belongings whilst you’re at the waters edge.